Ok, before you see this title and screech “LINS, WHAT THE HELL, ARE YOU MOVING? ?” the answer is no, we’re not moving. Not ever (probably). But now that we’re 4.5 years in to life in our “forever home”, I thought it would be fun to look back and compare what was on our wishlist versus how we feel about it all now. I’m sure we’re not alone in this but I do still love to look at Zoopla and see what’s going on in the area plus we always watch a bit of Location, Location, Location. Last episode was especially interesting as the two couples were looking in SE London/Kent and one couple with a WHOPPING budget of £750,000 had seen over 40 houses and still not been able to find one they liked. Maybe the more money you have, the more fussy you get, I don’t know. So it got us thinking about how many houses we saw and what was on our wishlist. Well, we saw 6 houses including this one. Renting in Forest Hill at the time we really wanted to stay in the area but the value had shot up in the 4 years we’d rented there and it became clear value for money wasn’t to be found anymore. We looked at two houses in Catford, one of which we loved but weren’t ready to buy and eventually it sold, two houses on the same street in South Norwood both of which were no-nos right from the start because it was a main road, Pete saw a house in Beckenham that was already fully renovated but they’d lost the garden in the process and then this one. And that was it. We didn’t have any other demands at all, absolutely nothing. And so maybe it was easier to find a house because of that, who knows. We put an offer in on this place, it was accepted and we moved in just six weeks later on Valentines Day 2014. The problem is that now we’re completely spoiled. All the things we didn’t think we needed originally would be now so hard to do without because you get used to them, don’t you? A working fireplace in the living room. Offstreet parking (which in London is definitely a premium, although we do still need to add more curb appeal instead of just our bricked driveway). 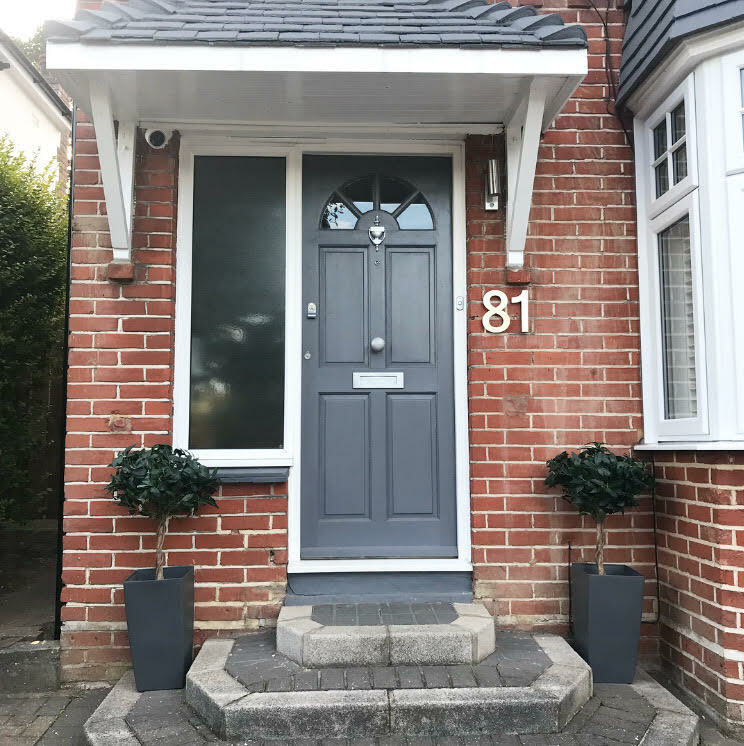 A semi-detached house – we were renting a terrace before and it was absolutely perfect but now we’ve had that little bit of separation I don’t know if I could go back, plus there’s so much more light from the landing windows. And the garden, oh the garden. I should say that we do have a railway line at the bottom of our garden. It’s a little branch line that runs two stops between Grove Park and Bromley North and back again. When I saw the map from the estate agents I almost instantly ruled this house out. But I would have been way too hasty. It’s not a mainline train service so it trundles back and forth every half an hour. It doesn’t run on Sundays or Bank Holidays. And what it does mean is that instead of houses at the bottom of our garden we just have huge, beautiful trees. Plus more space than we could ever know what do to with AND an outbuilding. Maddie could get all the exercise she needs just from running up and down. When we build our ground floor extension we’ll still have lots of garden left to enjoy and cultivate. So there we go. It’s funny how despite being very open-minded when we moved in, I think I’d probably now be a super awkward customer if I was ever house-hunting again. Thankfully though, that’s about as likely as pigs flying, at least for the next 10 years. I love our home and the area we live in more and more as time goes by so fingers crossed we’ll have no reasons to think about moving for the forseeable future. Have you changed your mind about what your must-haves for a house are after living somewhere? I’d love to know.